Joseph Gross Gallery is happy to announce a solo exhibition of new works by Northern California artist, Tahiti Pehrson. This will be Pehrson’s 2nd solo exhibition with Joseph Gross Gallery and his first solo exhibition at Joseph Gross Gallery’s new Los Angeles location. 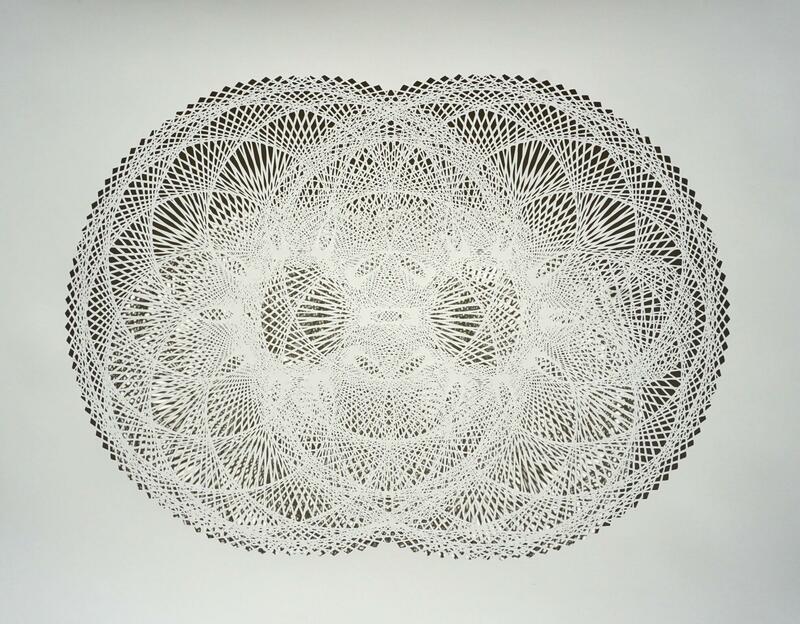 With this exhibition of new hand-cut paper works, Pehrson continues his 17-year exploration of multi-cultural traditions and patterns which are present throughout art history, architecture, nature and mathematics. Pehrson’s works demand a certain amount of attention from the viewers when exhibited. The shear meticulous nature through Pehrson’s process mixed with the shadow and light play allows for a very subtle but unique viewing experience. Elevating the spatial qualities particular to each commission, Pehrson’s works speak to site—shifting perceptions of volume and structure as viewers and light move around the work, evolving throughout the day. Tahiti Pehrson has exhibited his work through the United States and internationally: Notably at the Daelim Museum in South Korea. Pehrson has also had large installations installed at Facebook Headquarters and currently he is working on a large scale installation at the San Francisco Airport. Born in 1972 to artist parents in Santa Rosa, CA, Tahiti Pehrson began early life as a painter. Like many painters, Pehrson wanted to imitate light in such a way as to capture it. After traveling to Mexico, China and the museums of Europe in search of art, he moved to San Francisco to follow in the footsteps of his father by attending art school in the Bay Area. At the San Francisco Art Institute, Pehrson found himself increasingly disillusioned with painting as he was exposed to new ideas and modes of working. In reaction, he sought to “drop-out” of art and work in the streets with stickers and stencil making– a process that would evolve into a more developed and dedicated practice of paper-cutting, together with also beginning a new process of public engagement.